Are you leaving Microsoft Outlook for another email client? Most non-Outlook clients are unable to import Outlook .pst/.ost files because the format is proprietary to Microsoft. A workaround is to convert your Outlook .pst emails into an open email format called MBOX, or MBX. For converting email files to different formats, PstViewer Pro by Encryptomatic LLC is a useful and affordable Windows software tool. PstViewer Pro can read in files such as Outlook .pst, .ost, .eml, and .msg, then output the emails to different target formats, including MBOX, CSV, HTML, PDF, image files like PNG, GIF, and more. Today’s lesson is focused on showing you how to use PstViewer Pro to convert Outlook .pst files directly to .mbox. MBOX is an open format that is supported by most email clients (other than Outlook) including Mozilla Thunderbird. The first step is to open PstViewer Pro and choose your .pst file. Each email in the Pst file will be displayed on a line in the mail list. Next, click on PstViewer Pro’s “Export” menu tab, then select “MBOX from the drop down list. The partial screen shot below shows the Export menu with MBOX selected. Export Menu in PstViewer Pro software. Next, select the emails you want to add to the MBOX file from PstViewer Pro’s mail list. To select all emails, type CTRL-A. Selected emails are highlighted in blue. You can select all emails, a range of emails, or just certain emails. To begin the export process, click the yellow “Export” button. PstViewer Pro will display a status window that shows the progress of your conversion. If you have any questions, please post them in the comments here, or use our live chat to talk with us! What are .PST and .MBOX files? Pst files and Mbox files both email messages. While PST files proprietary to Microsoft Outlook, Mbox is an open specification used by email clients such as Mozilla Thunderbird. RFC-822 and subsequently RFC-2822 are the open specifications documents that describe internet messaging and embody the structure of .eml files. An MBOX file is a “mailbox” file which contains a collection of RFC-2822 email. So .MSG is to .EML what .PST is to .MBOX. RFC-822 was not directly adopted by Microsoft Outlook, the leading email client software in the world. Outlook email messages are stored in a single .PST file which may contain thousands of individual emails, messages including their file attachments. The specification for creating a .pst file is proprietary, and is determined by Microsoft Corporation. The .pst specification was closed until Microsoft began publishing parts of the specification in 2010. When Outlook exports a single email item from a .pst file, it is saved as a .msg file, which is also a proprietary Microsoft specification. Outlook .msg and .pst files requires Microsoft Outlook, or an Outlook viewer such as PST Viewer Pro. Emails within a .mbox mailbox are concatenated and stored as in plain text. The start of a message within the .mbox file is delineated by a line with the word “From” followed by a space and the return path e-mail address. Because RFC-822/2822 is an open specification it has been adopted by email client software such as Mozilla Thunderbird. It is still used to store and exchange email messages. Some companies prefer to store emails in this open standard, rather than in a proprietary standard. Microsoft Outlook does not directly support exporting email messages from a .pst or .msg files to .mbox or .eml files. To do this requires a third party add-in extension to Microsoft Outlook. MessageExport is a useful add-in for Microsoft Outlook for exporting email messages to formats that missing from Outlook. 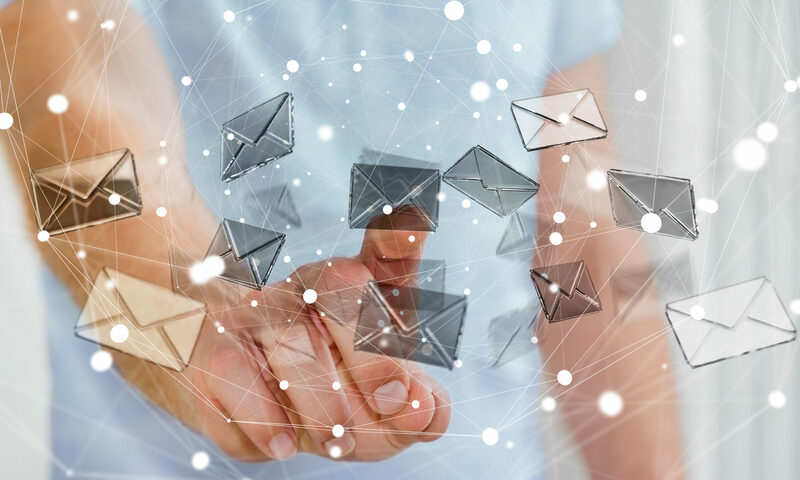 MessageExport integrates tightly with Outlook’s main toolbar to allow users to select email messages from within Outlook and then export the emails directly to .eml or .mbox format. In addition to .eml and .mbox, MessageExport also adds other export formats to Outlook, such as .pdf, .msg, mhtml, gif, tif, text, html, and many others. To export Outlook emails to PDF with MessageExport, click a message or messages in the Outlook message list so that they are highlighted. Next, select the export format from the MessageExport dropdown list (.eml or .mbox) and then click the Export button. MessageExport may ask you to select a target folder, and once done will begin to export the selected emails. If you export to .mbox, then all of your selected Outlook emails will be in a single .mbox file. If you export to .eml, then you will have one .eml file for each Outlook email that was selected. MessageExport also includes a “drag and drop” conversion capability. Using MessageExport’s Export Folder Explorer, you can immediately convert a message to the selected format just by dragging that file and dropping on a folder in the explorer. 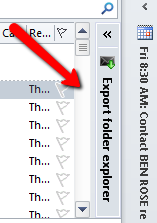 Export folder explorer in closed state, resides on the right-hand side of the Outlook window. To use it, click to expand. 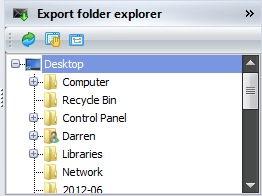 Export folder explorer in expanded state. Drag and drop email messages on the selected folder to immediately convert it to the currently selected format. MessageExport is a useful add-in for convert Outlook email message to .eml, .mbox, .pdf and other formats that are not natively included with Microsoft Outlook. You can download a free 15 day trial of MessageExport.